Serif Complete Creativity Suite 2 provides all of the tools you need to express your creativity right on your computer. 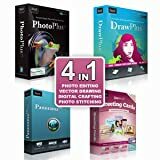 It includes the photo editing of PhotoPlus X4, the vector drawing of DrawPlus X4, the digital crafting of CraftArtist Greeting Cards, and the photo stitching of PanoramaPlus X4. Fix and enhance photos, draw and animate graphics, create and share stunning panoramic pictures, and make high quality cards for all occasions with the Serif Complete Creativity Suite 2. This entry was posted in Software and tagged Collection, COMPLETE, Creativity, Serif, Software by Computer Education World. Bookmark the permalink.